The most comprehensive Government files on UFO activity are opened to the public for the first time today and they disclose that even air traffic controllers and police officers have seen mysterious craft in the skies over Britain. The sightings range from incredible tales of little green men visiting the Wirral to corroborated accounts from policemen and pilots of Unidentified Flying Objects hovering above towns and cities. All are recorded on official forms, held by air bases and police stations, and compiled by the Ministry of Defence between 1978 and 2002. Disclosed for the first time is a report from three experienced air traffic controllers who attempted to “talk in” a UFO which landed on the runway before them. The incident occurred on April 19, 1984, at an East Anglian airfield which was operating two runways called 22 and 27. In the control tower a senior air traffic controller (satco) was supervising his deputy and an assistant. According to the report, the deputy was in contact with a light aircraft preparing to land on runway 22 when the satco noticed lights approaching the other runway. On Earth, such rinds coat volcanic glass weathered by water. How the glassy grains formed on Mars is unknown, but Horgan says magma from Martian volcanoes interacting with water ice and snow is a possibility. That would make these regions (pictured right) potential hotspots for alien life because they would have held chemical-rich water – a key ingredient for life. 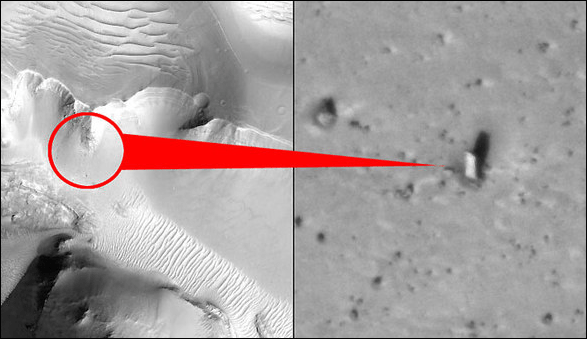 The object in question was first spotted several years ago after being photographed by the HiRISE camera onboard the Mars Reconnaissance Orbiter, a NASA space probe; every so often, it garners renewed interest on the Internet. But is it unnatural — a beacon erected by aliens for mysterious reasons, and even more mysteriously paralleled in the imaginations of Stanley Kubrick and Arthur C. Clarke, creators of “2001”? Or is this rock the work of nature? 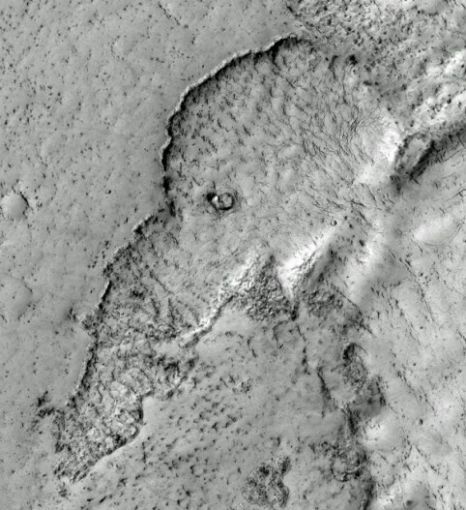 According to Jonathon Hill, a research technician and mission planner at the Mars Space Flight Facility at Arizona State University, who processes many of the images taken during NASA’s Mars missions, the object in question is no more than a roughly rectangular boulder. The HiRISE camera that photographed it has a resolution of approximately 1 foot (30 centimeters) per pixel — impressive considering the 180-mile (300-kilometer) altitude from which it photographs the Martian surface, but not quite sharp enough to capture the cragginess of a mid-size boulder. “When your resolution is too low to fully resolve an object, it tends to look rectangular because the pixels in the image are squares. Any curve will look like a series of straight lines if you reduce your resolution enough,” Hill told Life’s Little Mysteries. The ufologists aren’t necessarily wrong in calling it a monolith — the word simply translates from Latin as “one stone.” But this monolith isn’t the masonry of Martians.